AUBURN, Ala.—The spring of 2017 brought producers a mixed bag of weather. Many producers struggled with minimal soil moisture until the latter weeks of April when more than 10 inches of rain fell in areas of the northern part of the state. While rain fell in north Alabama, producers in central and south Alabama continued to plant hoping rain would fall and help their seed to germinate. After the first week of May, most areas of the state have seen enough rainfall to aid in germination of seeds already planted. The rain will spur on the growth of planted crops and wet the ground for what is sure to be a week of planting full speed ahead during the week of May 8. Weather conditions change by the day, and producers are always at the mercy of Mother Nature. Alabama Cooperative Extension System entomologist Dr. Ron Smith said cotton and soybean producers are not behind schedule if they are able to plant in the coming week. Smith said heavy rains act as a control method for early season thrips, working almost as well as a chemical spray. At the same time, some of the at-plant control measures may leach out of the root zone. He expects the seed treatments will be enough to control thrips in cotton emerging after May 15. Dr. Tim Reed, an Alabama Extension crops specialist—specializing in cotton and soybean pests—said not much cotton has been planted in North Alabama. Reed said North Carolina State University developed this model for southeastern cotton growers. 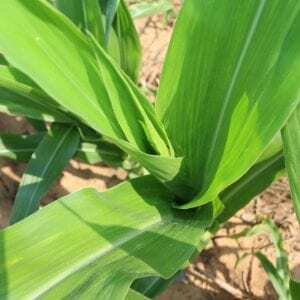 Thrips damage by planting date has been collected in Alabama and other southeastern states in the past to help develop this model. Milder than normal winter temperatures allowed stink bugs and grasshoppers to survive and thrive this spring. Smith said brown stinkbugs are heavy in wheat and will be moving to corn at any time. Additionally, he said producers in neighboring Mississippi and South Carolina—are battling grasshoppers. Reports of high numbers of grasshoppers statewide in Alabama are now coming in. Producers in north, central and south Alabama are currently dealing with grasshopper issues. Scouting for grasshoppers after the crop emerges isn’t a viable option. The most critical cotton stage for grasshopper damage is the “crook” stage. Smith said grasshoppers may be present in fields in large numbers and never inflict any damage. But the hoppers have the ability to wipe out a stand overnight and are not worth the risk of leaving the field untreated. In cotton, any insecticide applied at the lowest rate is an effective control method. Fortunately for producers, this means grasshopper control incurs minimal costs. Each farmer will deal with different levels of pest pressures depending on their location. Row crop producers are in a good position to control pests causing early season issues. However, cattle producers in northern Alabama are dealing with an unusual spring pest. Ryegrass in St. Clair County and fields in DeKalb County recently reported damage from a caterpillar in the Noctuid family. Extension professionals are working together with producers to determine what kind of caterpillar north Alabama producers are battling. Dr. Kathy Flanders, an Alabama Extension entomologist, said the caterpillars may be armyworms (not to be confused with fall armyworms) which occur during springs with cool, wet weather. “These armyworms, sometimes called true armyworms, infest various grasses including perennial ryegrass, wheat, corn and tall fescue,” Flanders said. The occurrence of damaging caterpillars this early emphasizes the need to scout forages. Sweep net sampling can detect caterpillars when they are small before they begin inflicting damage. Find more information on insect pressures in crops and control options online at www.aces.edu. Contact your local Extension office for assistance in the field. Scouting guides can also be found on www.aces.edu.